Thank you for your support of OBV. Due to exceptional demand the advertised Al Sharpton event sold out within minutes. Please no longer contact the office regarding the event. Sorry for the disappointment, and thanks again for your support. The African American civil rights leader Rev Al Sharpton will once again team up with Operation Black Vote, and Blaksox to address an audience in Parliament to talk about the rise in knife and gun crime in the UK, the punitive drugs policy which disproportionately targets Black youths, and Windrush. 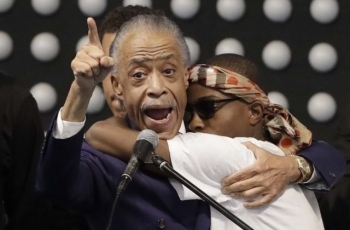 Rev Sharpton has long been a good friend, and supported Black British race equality campaigns and individual families, such as the parents of Roland Adams who was racially murdered in 1991. Sharpton has 50 years of frontline race equality campaigns, from his early days of working with Rev Jesse Jackson back in 1969 on Operation Breadbasket, to becoming a senior advisor to President Barack Obama. More recently, Al Sharpton delivered the eulogy for Stephen Clark; Clark was shot in the back with 20 bullets by police on March 18 sparking public outrage. Here in the UK Sharpton will draw comparisons with the US ‘war on drugs’, which too often translates to a war on Black communities. We at OBV are proud to have such an important ally in the fight for racial and social justice. Other speakers alongside Sharpton will be The Right Honourable Diane Abbott MP, Margaret Bankole, Patricia Lamour and Lee Jasper.